Women’s flared jeans from MM6, the sister line of Parisian fashion house Maison Margiela. 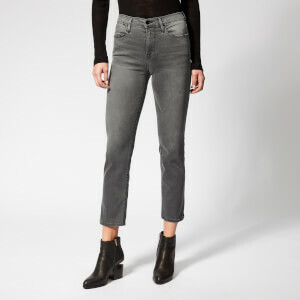 Crafted with soft, pure cotton in a bobble-textured finish, the black jeans feature a mid-rise waist, belt loops and five pockets across the front and back. An exposed buttoned fastening and frayed cuffs add detail. Signature stitch detail to the back adds the finishing touch to the design. Main: 100% Cotton. Lining: 65% Polyester, 35% Cotton.